I love this easy top! You can't beat it for $34. It is a great Spring and Summer basic and it comes in five different colors. Ok I am always looking for comfortable shoes. I had never heard of the brand Five Worlds before. But I saw these and thought they were really cute but then when I tried them on I was sold! They seriously are so comfortable. I was shocked that a comfort shoe brand made such cute shoes. Don't forget to shop the Shopbop Spring sale that is going on. I linked some of my favorites in yesterday's post. I am planning on ordering a couple of things today. I definitely need a few basic tops like this. Can't beat the price! Love this top in this outfit! Simple and a really cute outfit! Your jeans are fitting you perfectly! Such a great basic piece for spring! Love this color. Love the bright colored top. Super cute look! Love the color of your top. Those shoes are amazing!! They will be the perfect pair for all of summer. 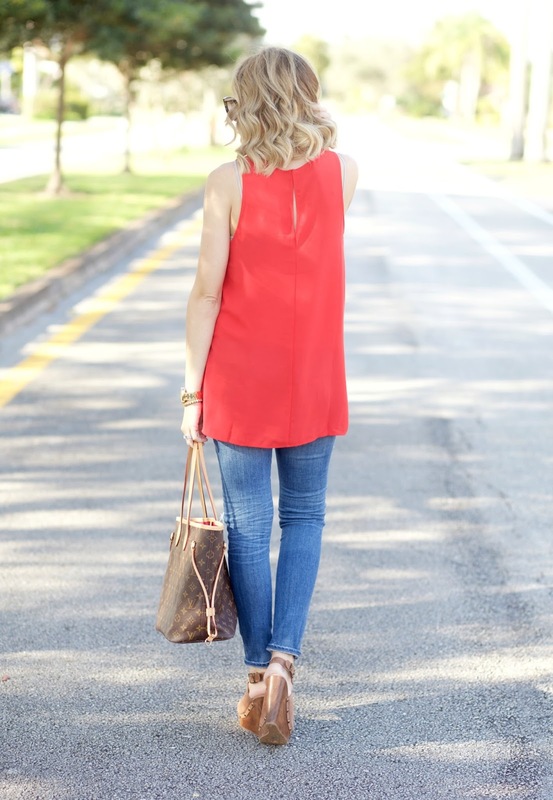 Love your top -- perfect for spring! Just found you blog ... what a great style guide for those of us who are less adept at putting outfits together. You have already helped me be more creative. I'd actually love to know how tall you are? It would help when picking out sizes and understanding where clothes would fall on my frame. Love this look! You totally are rockin' the preggo style :) I've been following your blog/IG for awhile now. Both our girls were born in Jan. last year and I'm also currently pregnant with a baby boy, due in May! I love that top! That color looks so good on you! Love this look! Very casual and stylish! Those wedges are super cute and look very comfortable. Love this look! I miss seeing your beautiful posts, I hope you're doing okay Jade. I thought Matt getting an at home mani and pedi for you was THE sweetest thing ever. We're all pulling for you and can't wait to meet your baby boy! All the best Jade, xoxo. This entire outfit is perfect for spring!! I also LOVE the shoes! They look so comfortable!